Breakfast Benefits | Winners Drink Milk! You and your children will feel full longer and may get less hungry throughout the day if your first meal has protein-rich foods, such as eggs, Greek yogurt, low-fat dairy products or lean meat, and fiber-filled fare, such whole-wheat bread, whole-grain cereal, fruit and vegetables. These foods appear to have more staying power than highly processed foods such as bagels, muffins, doughnuts and sugary cereals unless you add cheese, yogurt cheese spread and/or milk to them. Research from the University of Missouri shows that when teens eat a higher-protein breakfast, they have reduced feelings of hunger and increased fullness right away and that feeling of satiety continues throughout the day. The findings are especially important for school-aged children who may be ravenous by lunch time if they don’t eat a good breakfast. Other studies show that students who eat breakfast do better on standardized tests and have improved cognitive function, attention spans and memory skills. Plus, kids who start the day with healthful fare are also likely to have consumed important nutrients such as calcium and vitamins. However, surveys show that between 30% to 60% of kids skip breakfast. Teens are more likely to miss it than younger children, Leidy says. And many of those who eat breakfast are consuming high-fat, high-sugar processed foods that have relatively no impact on satiety. In order to get the full benefits of the satiety from this kind of breakfast, the meal needs to be approximately 300-350 calories. Just grabbing a piece of fruit or granola bar is probably not enough to keep hunger at bay. Breakfast suggestions that are protein packed! If you have 100 calories of eggs at breakfast or the same calories in the form of a plain white bagel, chances are that several hours later you’ll be less hungry if you had the eggs than if you had the bagel. 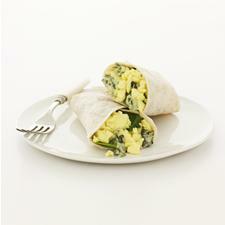 Try a breakfast burrito using scrambled eggs inside a tortilla with a glass of milk for a hand held breakfast. One cup of Greek yogurt with a slice of whole-wheat toast topped with a teaspoon of peanut butter will keep your children’s stomachs from rumbling. Making a parfait with yogurt, fresh fruit and granola will give you enough protein to last until lunch. Banana smoothie: Blend 1 cup fat-free or low-fat (1%) milk, a medium banana, and 1 teaspoon vanilla extract in a blender or food processor. Serve with ½ whole-wheat English muffin topped with a teaspoon of peanut butter or trans-fat free tub margarine. Slice of pizza and 8 ounces 100% orange juice. Toasted whole-grain waffle sandwich with 2 tablespoons sunflower seed butter, peanut or almond butter with ¼ cup raisins; serve with 1 cup low-fat yogurt or milk. Breakfast pita: Scramble one or two eggs and place in half a whole wheat pita pocket then top with ¼ cup shredded reduced-fat cheese and salsa; serve with 8 ounces 100% orange juice. Plain, 1 minute or instant oatmeal microwaved with fat-free or low-fat (1%) milk with small chopped apple stirred in and topped with 2 tablespoons chopped walnuts.